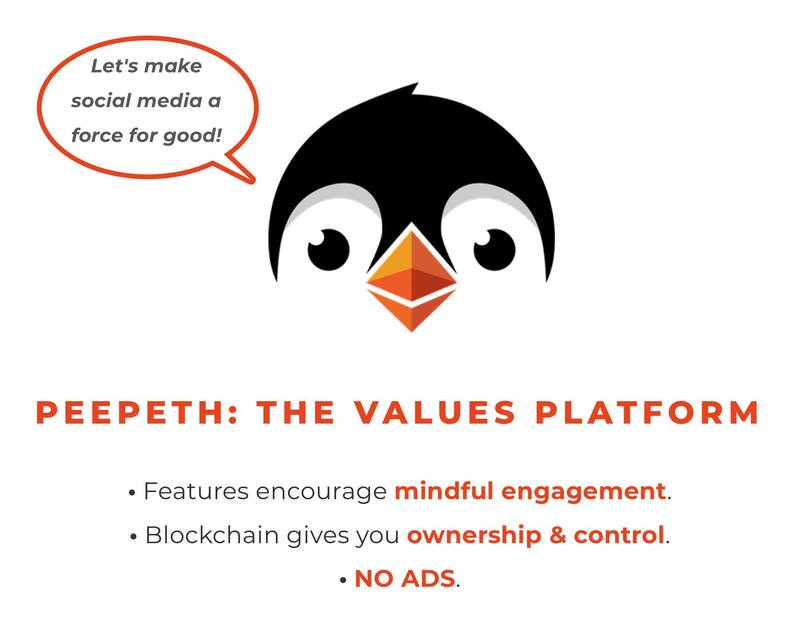 Peepeth is a blockchain-powered social network promoting mindful engagement, both online and in the world. The crowdfunding campaign is over! Thanks to all who've supported. With Ether, tokens, or credit card. Features encourage thoughtful content, altruism, and self-awareness, while discouraging reactive and hateful posts. Peepeth gives you true ownership of your online legacy because data is saved to the Ethereum blockchain. Blockchain data is open, decentralized, and immutable. First peep by the founder of Ethereum. 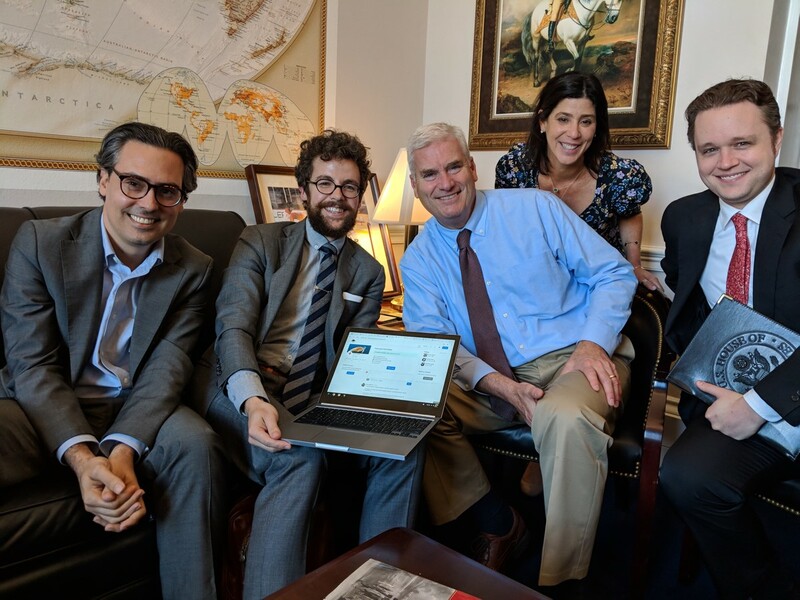 Coin Center demonstrating Peepeth to United States Congressman Tom Emmer of Minnesota’s 6th District. Look familiar? Some problems with social media today. All data is openly stored on the Ethereum blockchain. Anyone can monitor the blockchain data. Insight credits can also be gifted. One credit entitles you to perform this analysis on your peeps or on your content on another public social media account. Learn more here (under development). \-Alejandro Machado, "Ðapp User Experience Audit"
Peepeth’s invite-only web beta is live, and is leading the way for decentralized app (dapp) usability. 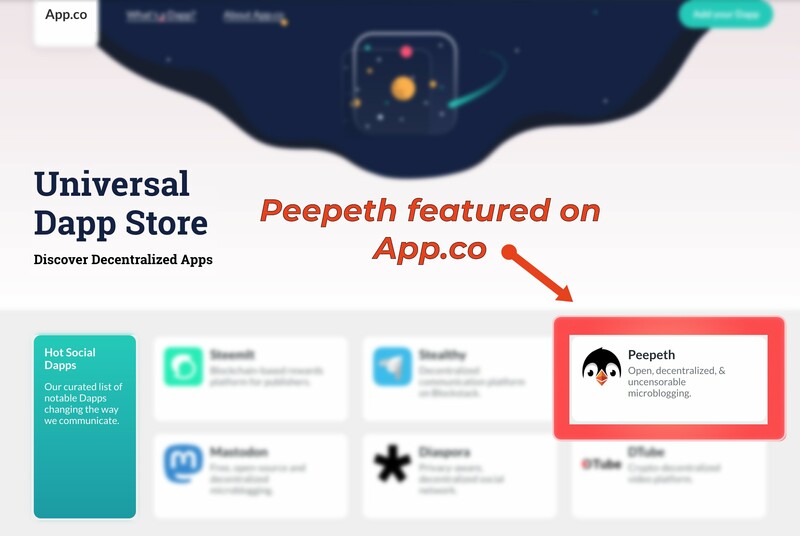 Peepeth is one of the few non-game and non-trading blockchain apps in use. It has pioneered novel techniques that make it very user-friendly. It has received 10000+ invite requests, and tens of thousands of peeps have been immortalized on the blockchain. It is currently featured on every major mobile dapp browser (Trust, Toshi, Status, Cipher), and by dapp portals such as App.co, EveryDapp.com, and other portals. Users need cryptocurrency to use Peepeth. Getting it is hard. Users need special software (a browser extension or dapp browser) to use Peepeth. Reaching the stretch goals will give Peepeth a much better chance of becoming a self-sustaining mainstream platform. Peepeth will do the best it can regardless of the amount raised. How can an advertising-free platform sustain itself? Peepeth sells features and takes 10% of tips. For example, it sells social media verifications, Insight credits (in development), and feature badges (such as the rewards here). The success of verifications alone is showing that this model can be a viable alternative to advertising. Kickstarter funding will help build Peepeth into a product that can sustain itself without ad revenue. Peepeth’s rewards enable special functionality on Peepeth.com. Most rewards consist of at least one blockchain badge (enabling special abilities), and Insight credits that can be gifted or used to gain personality insights from your peeps or other social media accounts. Supporters at all levels will have their name immortalized on IPFS and the blockchain (including their link and message at some levels). This info will be shown on a special backers page on Peepeth.com. If your blockchain address owns a blockchain badge, Peepeth will detect it and grant your account special powers. Badges will be displayed on your peeps (except Authenticity badge). Some badges have unique names, images, or other unique inscriptions. If you are rewarded a unique badge, you can name / inscribe your badge on a first come first serve basis (or it can be done later, or not at all). Badge details will be displayed on your profile page. Blockchain badges are transferrable, but you'll need a small amount of cryptocurrency to send them (to cover the blockchain transaction fee). Insight credits are not transferred with the badge; you have to transfer them separately. Some badge privileges (automatic #nsfw flagging of peeps) can be deactivated if abused. Some support levels include extra badges in addition to the main one. The extra badges do not come with the Insight credits, tshirts, nested badges, or inner-circle privileges that normally accompany badge purchases. For example, the Penguin badge comes with two Honor badges. Honor badges, purchased by themselves, usually include Insight credits, tshirts, and lower-tier badges. However, the Honor badge that comes with the Penguin badge will not include those extras, just the core functionality of the Honor badge. Insight credits are non-blockchain credits that can be used on Peepeth.com. Each credit can be redeemed for a personality assessment of your public peeps, done by advanced artificial intelligence developed by IBM Watson (substantiated by research). You'll receive a graph showing your personality traits and other characteristics, which you can display publicly on your profile, keep private on Peepeth.com, or delete completely. You can re-test at a later time, and also compare your Peepeth results with your other social media accounts. Insight credits are giftable (you can bestow them on peeps you like). At some support levels, you’ll get a behind-the-scenes look at the creative process, in the form of emails / video updates from the founder. Supporters will be kept in the loop in a way not commonly seen with other software development projects. These updates will be more impromptu than formal; and give you a personal perspective on the process of building Peepeth. At higher levels, backers will have their logo displayed on the front page of Peepeth.com for one year. The more your company contributes above 10k, the higher and larger its logo will appear. With funding, Peepeth will have a good chance of becoming the first mainstream dapp (decentralized application) and could introduce cryptocurrency and Ethereum to a mass audience. In addition to being a social media platform, Peepeth will be an easy introduction to cryptocurrency. It will teach users the basics, while not requiring them to buy cryptocurrency or install special software. Peepeth will also incentivize new users to acquire ether, because of the optional services offered on Peepeth and the opportunity to interact with other dapps. Peepeth is fundamentally different because of its focus on encouraging mindful engagement & positive contribution, its use of the blockchain, and its lack of reliance on ads. You control your blockchain account and content. No ads. They're not only unpleasant to see, but introduce perverse incentives to keep you engaged at any cost. Peepeth.com is not a neutral “anything goes” platform, despite the immutability of its datastore. The emphasis here is on cultivating mindful engagement, positive contribution, and self-awareness. Peeps that are not in accord with the terms of service will be removed, by default, from the main feed. Peepeth’s criminal appeal is limited. Pairing payments and communications on the same channel reveals more info about criminals and their networks than non-crypto communication channels used with crypto payments. Pairing communication and money removes a level of anonymity because of the traceable nature of blockchain transactions. Peeping is not a smart way to conduct illegal activity. Will Peepeth be usable by people not versed in crypto? Yes. The blockchain will be largely invisible when using Peepeth. Peepeth will, however, educate users about blockchain, and offer optional blockchain-based services. What if the goal amount isn't reached? Peepeth will achieve as much as possible with the amount raised, regardless of whether the goal is reached. No refunds will be issued. 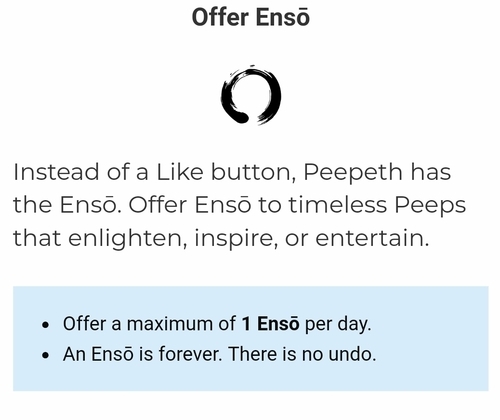 Although there are rewards associated with each tier, supporting Peepeth should be considered a donation rather than a product purchase. See the next section for a discussion of the risks involved. What will happen to the ether or tokens I send? Ether will be used to fund Peepeth's development (and will likely be sold at some point to do so). Tokens are immediately converted into ether. See the estimated due date for each reward. 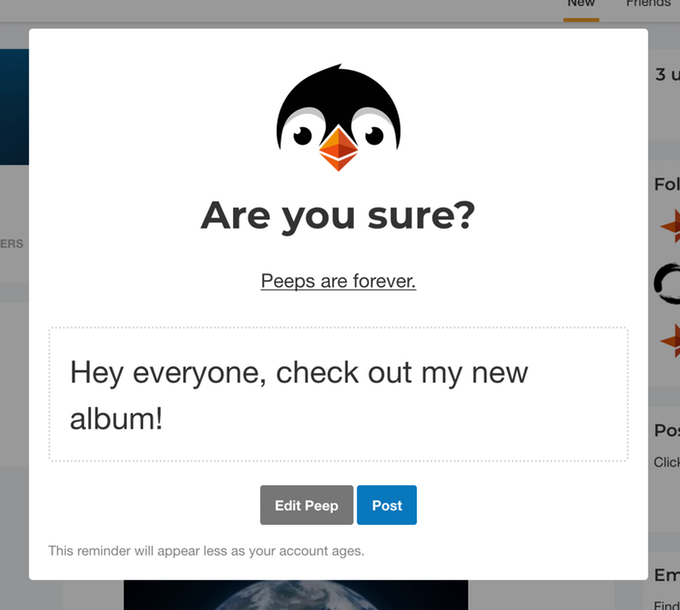 Read more FAQs about Peepeth here. There are many challenges ahead for Peepeth. Building decentralized applications is hard; making them usable and scalable is harder; and bootstrapping a community is the hardest. Nonetheless, Peepeth has made headway on all three fronts with limited resources. A lot of technical and design heavy lifting is done, and there’s a small but strong community in this invite-only stage. The next steps will be challenging, but with funding, I’m confident they’ll be completed. Read more about the risks and challenges facing Peepeth. A general risk that Peepeth faces is the difficulty of predicting a timeline, because of the unpredictability of software development. To mitigate that risk, the estimates here are somewhat conservative. Regular updates will be sent to keep everyone informed of progress. A related challenge is the eventual possible strain on the Ethereum blockchain, as users may choose to use optional blockchain features. Note however that using Peepeth will not result in additional blockchain transactions, because of an efficient batching mechanism that Peepeth uses; so network impact will likely be minimal. Also, scaling efforts are underway for Ethereum itself, and those non-essential features could be throttled. The technical challenges, difficult though they may be, are surmountable. The more difficult challenges are social in nature and relate to product appeal, usability, and bootstrapping a community. Peepeth is not a neutral platform, and its goal and value proposition will polarize. The charity aspect and positivity focus of Peepeth will grate on some, and others may not like how it attempts to encourage mindful discourse & positive contribution. That’s by design, but it will nonetheless be important to get the branding and messaging right, so that Peepeth’s intent is understood. The perceived complexity of the blockchain is also a risk for wider adoption. Although blockchain will be almost completely abstracted from the user experience, users will still have to be educated about keys; and many lay users may simply abandon the process at the word “blockchain". It’s unknown to what extent this will deter users; but a major effort will be put on on-ramping and educating users as painlessly as possible. 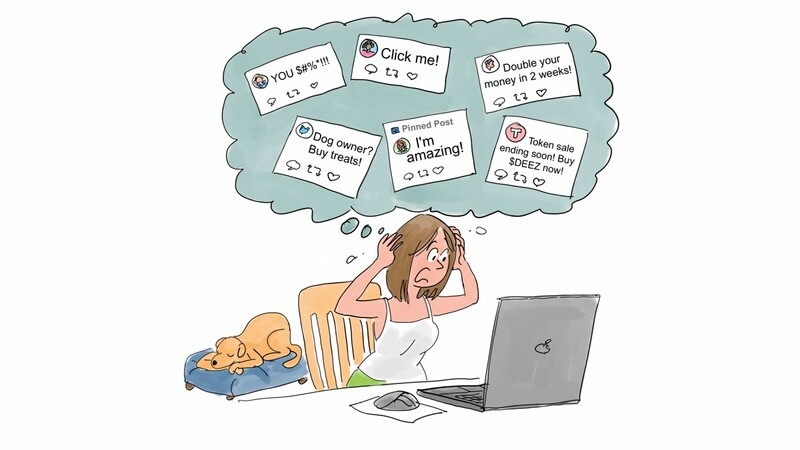 Existing social networks pose a risk. The network effect of the incumbents is strong, so Peepeth will have to be focused in its approach and branding and make itself unique. Gaining mainstream traction will take time. Government regulation of crypto could also pose a risk. Crypto is restricted or illegal in some countries; and that could affect Peepeth’s future. New ventures are risky. Blockchain applications are perhaps especially so, because of the additional complexity and user confusion they can cause. However, Peepeth has made strides so far, and has a good chance of becoming the first mainstream dapp. Thanks to the thousands of people who’ve shown support for Peepeth by requesting an invite, joining and peeping, or offering advice and suggestions. I appreciate everyone’s contributions; Peepeth would not be possible without your help! To support Peepeth with ether, tokens, or credit card, first select a reward below. Peepeth.com seeks to promote mindful engagement online and in the world. Peepeth will continue to experiment with novel features in its attempt to foster thoughtful, unreactive discourse. Peepeth.com is not an "anything goes" platform; like almost every other site, it is moderated. Social media is a contentious topic. Peepeth is trying something new and may not appeal to everyone. There are more expedient ways to build a social network, but Peepeth is aiming for positive impact. Peepeth's roadmap is evolving. Specific features associated with a badge will likely change or be removed. There are no refunds; Peepeth will do the best it can with the funds received. Consider your support a donation in support of the overall mission, rather than for the purchase of specific features. I would like a reward. Get a unique (numbered) badge with superpowers that you'll truly own. Lives on the blockchain and will be sent to your Ethereum address. Badge is visible on your profile. Unique (numbered) badge with superpowers that you'll truly own. Lives on the blockchain and will be sent to your Ethereum address. Badge is visible on your peeps. 👮 Keep Peepeth clean. Your #nsfw flags take effect immediately. 🖼️ Multiple pictures allowed in your profile. Limited edition, individually-named badge that lives on the blockchain (you truly own it). Each individual badge is named after a creator of your choice (list TBA). First come, first serve! 🎨 Customize the color scheme of your profile. 👨‍👩‍👧‍👦 Inner circle (access to private chatroom). Each individual badge is named after a leader of your choice. First come, first serve! 🖼️🖼️🖼️ Post up to 3 images in one peep. Each individual badge is named after a Nobel Peace Prize laureate. First come, first serve! Hard limit; no more will be available until new laureates are announced! Your badge will be named after and inscribed with a haiku of your choice by Matsuo Bashō. First come, first serve! 🖼️🖼️🖼️🖼️🖼️🖼️ Post up to 6 images in one peep. Inscribe your badge with the name of whoever you want (not yourself). First come, first serve! Submit an image to be inscribed on your badge (visible on your profile page). Receive various badges and other rewards (see below), and have your name or logo on Peepeth's front page (/welcome) for a year. A special badge inscribed with any text (< 1000 characters) and image you want. Various lower-tier badges (see list below). Your name or logo on Peepeth's soon-to-be redesigned front page (/welcome) for a year. The more your company contributes, the higher and larger its logo will appear relative to others. 🖼️🖼️🖼️🖼️🖼️🖼️🖼️🖼️🖼️ Post up to 9 images in one peep. 🐧 Give more to have your logo displayed larger and higher than others. The third-largest species of penguin. They call in a variety of ways, but the most frequently heard is a loud trumpeting which is emitted with its head thrown back. (-Wikipedia). This has the same benefits of the Penguin badge. The king penguin (Aptenodytes patagonicus) is a large species of penguin, second only to the emperor penguin in size. (-Wikipedia). This has the same benefits of the Penguin badge, plus a secret, penguiny feature unique to this badge. The emperor penguin (Aptenodytes forsteri) is the tallest and heaviest of all living penguin species (-Wikipedia). Size isn't everything. Speed and maneuverability have their advantages. The little penguin (Eudyptula minor) is the smallest species of penguin. (See Wikipedia for more).